A GOAL in the third minute of injury time stopped Dumbarton sharing the points in a closely contested division one match on the Starks Park quagmire. A GOAL in the third minute of injury time stopped Dumbarton sharing the points in a closely contested division one match on the Starks Park quagmire in front of a 1,340-strong crowd. On the heavily sanded pitch, with water spraying up on almost every kick, the two sides delivered an enthralling match despite the difficulties, and a draw would have been a fair result. Allan Walker netted from a tight angle after half an hour to give the home side the lead, but just before the break skipper Bryan Prunty — who had earlier missed two golden chances (one of which is pictured) — drilled home a low shot to equalise. 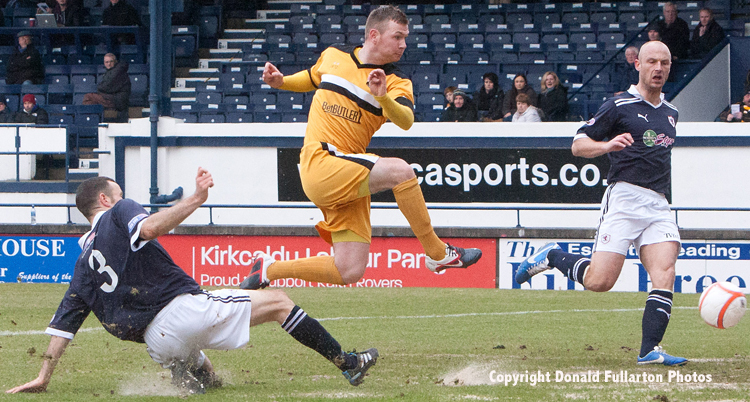 On 52 minutes Pat Clarke put Raith back in front, but six minutes later Prunty grabbed a second equaliser. From then on it was end to end, and as the final whistle looked a draw seemed likely. However prolific striker Brian Graham shot home with almost the last kick of the ball to keep all three points in Kirkcaldy. Plus points for manager Ian Murray, who had to make five changes because of injuries and suspensions, were the performances of new signings Nick Phinn and Owen Ronald, and on loan Rangers defender Stuart Urquhart.